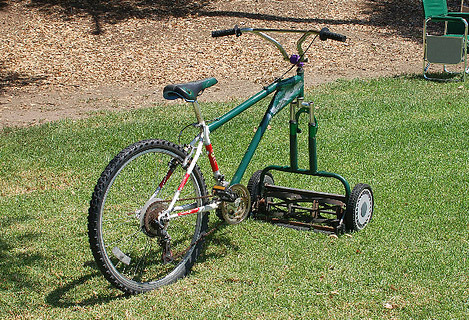 Got a big lawn to cut? One word: Mowercycle. This shot has been circulating around the blogosphere for a while, but it’s too good not to share. This is obviously a home-made contraption, and it’s doubtful it would be that effective in its current incarnation, but the sheer popularity of the idea and its catchy name lead me to believe its a product just waiting to be properly engineered and designed. As I searched around, I discovered a link to someone who’s tried it in a slightly different configuration, and a motorcycle version that just looks scary. So what would it need to work? Perhaps an electric booster motor. A beer holder, obviously. And as my 8 3/4 year old son Jaxon suggested, maybe the mower part would work better at the back. Lots of fodder for engineering exploration here! What’s not in doubt is its easy marketability. So if this is your idea, or your photo, and you want to take it to the next level, give me a call. As for the URL – mowercycle.com – talk to me about that, too. I registered it yesterday. Previous: « Marketing a kinder, gentler style of driving. I saw a BOB trailer retrofitted into a lawnmower at Interbike last year. It looked like it could work! Nice to have met you at EPIC Sustainability Show … looking forward to your observations on the event.